The Carnohan Family: Uncle Erkie is home!!!! 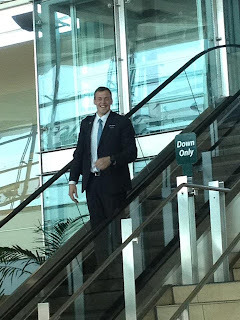 May 9, 2012: Kyle's brother Eric has been serving a mission for our church, The Church of Jesus Christ of Latter-Day Saints, for the past 2 years in New York City. He was an awesome missionary who served NYC with all his heart, and was privileged with many leadership roles as well. We are so proud of him and his selfless decision to serve the Lord for 2 years. We missed him so much, especially my boys. They love their Uncle Eric and love his playfulness and undivided attention he gives them. I missed my favorite Carnohan, besides Kyle! And Kyle missed his skateboard buddy, besides his other brother Ryan, and his sense of humor. We are so glad you are home, but bummed we missed your homecoming to San Diego.